Metal Fabrication is a fast-paced industry that is ever-dependent on external factors such as global economy, market demands, technological progress, raw material availability, market competition and much more. Every fabricator aims to bring in that differentiating factor in their business to beat the competition and achieve profitability with efficient time management. Many fabricators do use the latest technology such as laser cutting machines, state of the art welding & bending equipment, integrate it with an ERP software to simplify their operations, achieve more productivity in less time and open the scope of exponential growth. However, they still find it hard to meet strict timelines and face material wastage, over production, increased labor costs (over time), inventory overstock, delayed order dispatch, increasing operational costs etc. So how do they solve the problem? The key factor that fabricators need to tame is Data. Fabricators follow multiple processes in their unit and all these processes generate data. Lots of them. The sad part is most of it goes unused and very little is consumed to improve existing processes and increase production efficiency. If fabricators channelize their data through appropriate systems and technology in place, most of their critical business & operational decisions can be taken based on data thus preventing speculation/impulse based decisions that can have an unpredictable impact..
We will demonstrate how fabrication is all about data movement. Let’s look at a scenario below. A customer places a Request for Quotation (RFQ) via phone call, an email, the fabricator’s e-commerce portal or the website or via Electronic Data Interchange (EDI) system. Assuming that all the above sources are integrated with an ERP system, the personnel creates an instant quote with real-time updates of BOMs, material & vendor costs, current inventory availability etc. On getting a go-ahead by the customer, the ERP records and processes the order for further fulfillment. Based on the order requirement and delivery date, the ERP prioritizes the order over other orders and checks for available inventory. If the inventory is available, it goes ahead with scheduling the order for further processes such as nesting, bending, welding etc. Its integration with these technologies enables it to communicate the requirement information. For example, if the next process is nesting, the ERP communicates the BOM and order information to the nesting system which then accommodates the parts with other orders to form a dynamic nesting layout to ensure maximum material utilization, minimal wastage and high output. Cutting edge technology ensures that the yield percentage is always between 90-95%. After the nesting process, the cut parts are applied with move tickets (containing barcodes) to track where are they going. This is to ensure that no parts are misplaced and that they move to the right process (welding, bending etc.). Once the job is completed, the respective machine/operator notifies the system and the ERP marks the respective work order as complete before it moves to further steps such as assembling, packaging and customer delivery. In this process flow, we highlighted the automation part of it but what is the end result? Seamless data flow between diverse systems & machines to produce the end result right on time. Not only the production process, but even gauging customer demand and managing supply chain and logistics are very well taken care of if data movement is seamless. Let’s look at it in the same scenario. Catering to multiple industry types makes it really difficult for metal fabricators to forecast demand and schedule production accordingly. The risk of production delays based on incorrect scheduling, inventory over/under stocking increases to a great extent. Having a data-based approach towards gauging customer demands and scheduling production accordingly helps to a great extent. Your ERP software contains a minefield of data that indicates lifecycle of various products that are manufactured. Analyzing these along with current market demand and historical sales will help fabricators to chart their forecast accurately. It is good to keep in mind that market demand is volatile owing to external factors such as local/global economy, market competition and customer buying behavior. Also, there are various tools that are integrated with customer’s forecasting tools and this gives a direct view to how production will look like in the next few months. Any change in their forecast will impact production schedule but fabricators will know it beforehand and be ready for it. Fabricators work with multiple suppliers who supply them with raw materials, steel rolls, welding gas, cutting/bending equipment and other associated goods and services. An integrated supply chain provides a real-time view of supplier information, their historical performance (supply time, product quality, credit history etc.) and pending order fulfillment. This helps the fabricators to pre-empt a requirement and place order well in advance so that the goods arrive just in time for production. This way, the final dispatch of goods does not get delayed. A metal fabrication unit is a high-risk environment with chances of injury to personnel being higher than usual. Fortunately, machines come equipped with sensors that regulate operating temperature, vibrations, sound, operation/idle/breakdown time and other factors. These sensors feed continuous data to the software thereby helping operating personnel to check for any deviation or a glitch. If detected, it can be rectified immediately before a possible machine breakdown or a safety hazard. This ensures high safety levels for both the fabrication environment and the personnel operating it. Catering to variety of industries such as automotive, aerospace, industrial machinery, precision products etc. brings a whole new level of challenge i.e. ensuring that all products comply with respective industry standards. This can be easily managed with an ERP. ERP’s have an in-built documentation management system that lets fabricators document regulation standards of various organizations/industries, supplier and customer details, quality control parameters, quality control systems, inventory movement, quality reports, certification details and much more. Personnel can track quality non-conformance through a centralized database that is integrated with RMA, shop-floor transactions and inventory. The ERP can also track quality of 1st piece inspections and monitor rejects. Using advanced quality management dashboards, personnel can analyze quality metrics of manufactured products, suppliers, procured parts and overall operations. 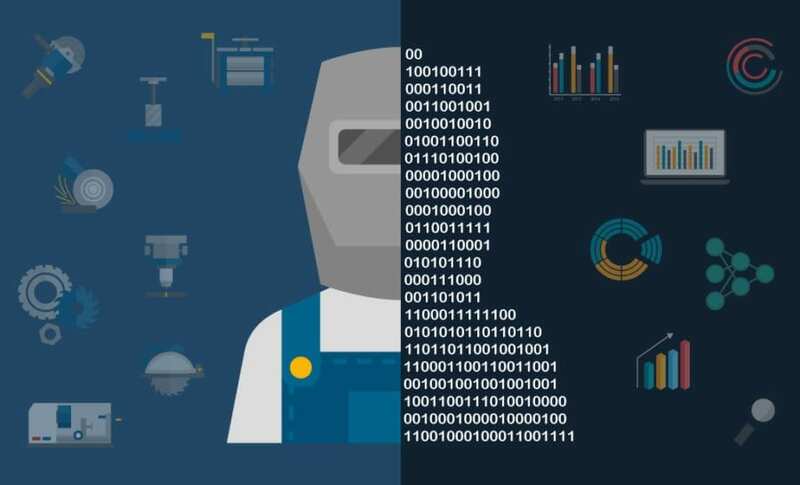 We have just given you a snapshot of how data flows seamlessly between advanced machinery, tracking sensors and software systems within a Metal Fabrication Unit. The end-result is that fabricators can take timely decisions backed by data and ensure that they achieve uninterrupted production, greater operational and supply chain visibility, just-in-time delivery efficiency and profitability. Investing in an advanced, high-quality automation system is not an option anymore. After all, in today’s technologically driven age, fabrication is not just about welding, cutting and bending steel. It is much more beyond than that, it’s all about Data.